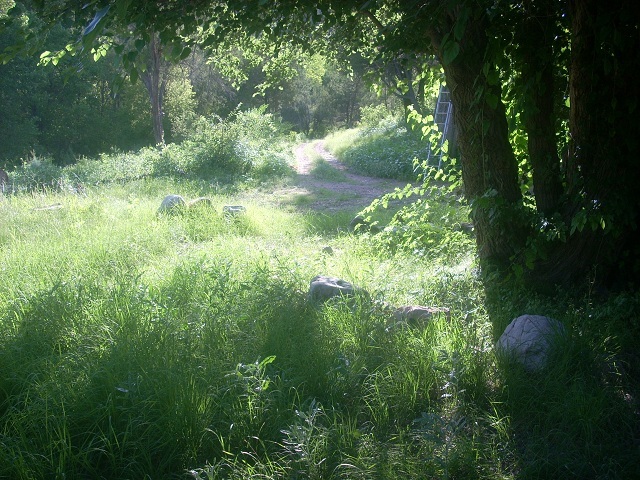 Our 55 acres are grandfathered into the Gila Wilderness which occupies a large section of southwest New Mexico. We leave Silver City and travel about 10 miles on Bear Mountain Road, cresting the mesa where we enjoy spectacular views of the Mogollon Mountains, before we drop into our stream valley. 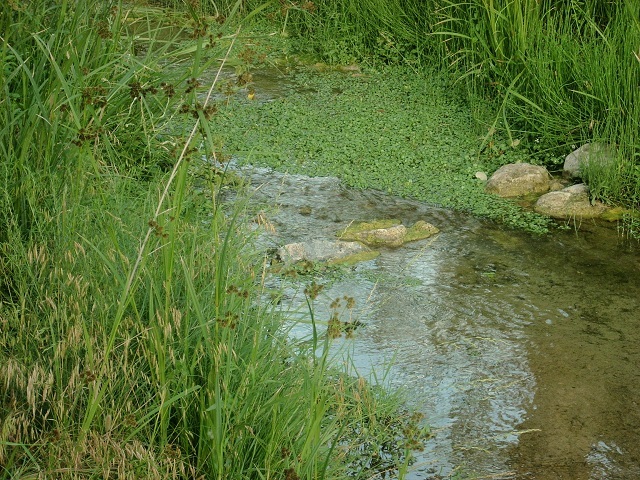 Little Walnut Creek flows through our property year around, fed by Allen Springs at the upper edge of our land. 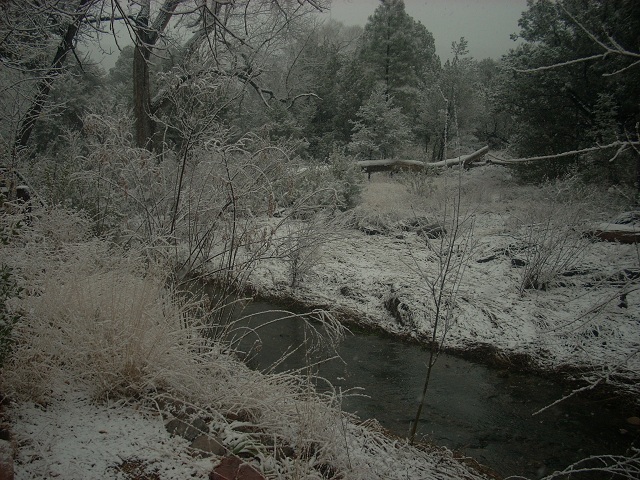 With our 2 neighboring families we have fenced 250 riparian acres, some of the precious headwaters of the Gila River. Our elevation is approximately 5,700 feet. 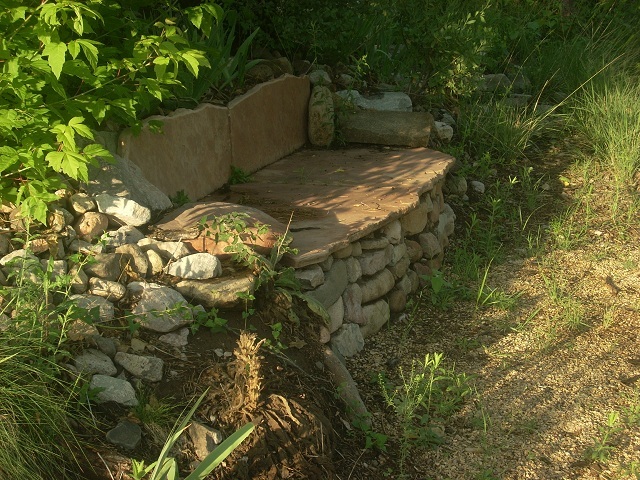 Our parcel has stream frontage on both sides of the stream for approximately 300 yards, and includes a hillside with pottery shards and stone formations that indicate where Mimbres Indians lived. Pinion, Juniper, Ponderosa Pine, and high desert vegetation cover the hillsides; Cottonwood, Box Elders, Black Walnut, Mulberry, Sycamore, and several varieties of Willow inhabit the riparian area. 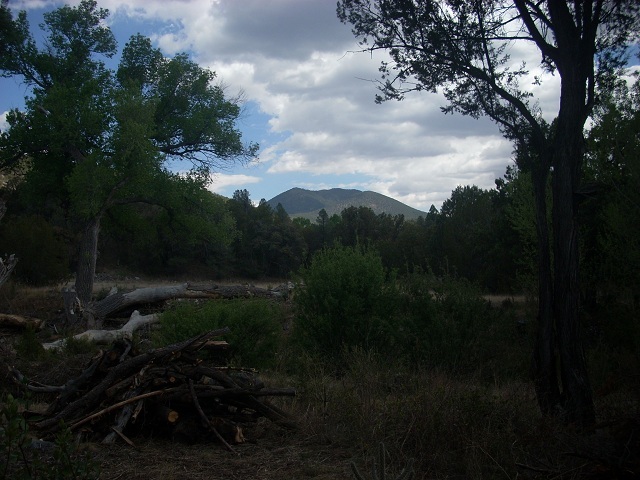 The Gila Wilderness is home of the Bobcat, Cougar, Black Bear, Mule Deer, White-tailed Deer and Pronghorn deer, skunks, raccoon, javalina and coyotes. The Gila is known worldwide for bird watching. Wild turkeys and green heron visit frequently. 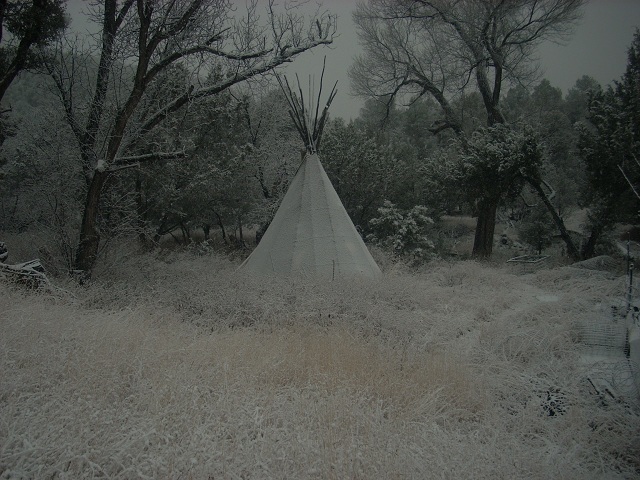 The U.S. Forest Service describes the climate of the Wilderness area as "four gentle seasons." 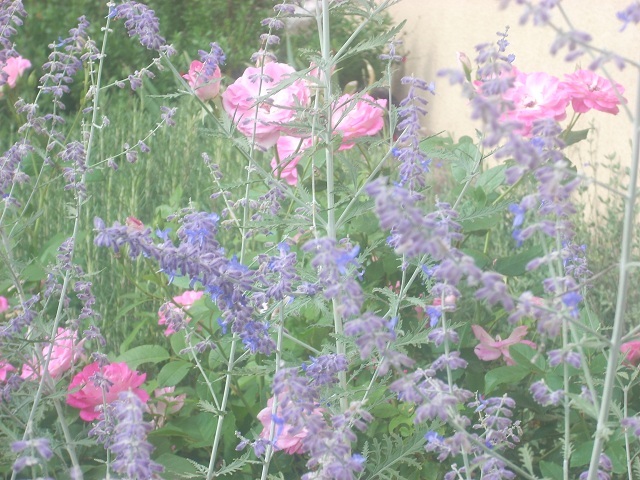 Elevation and summer monsoons moderate summer temperatures. 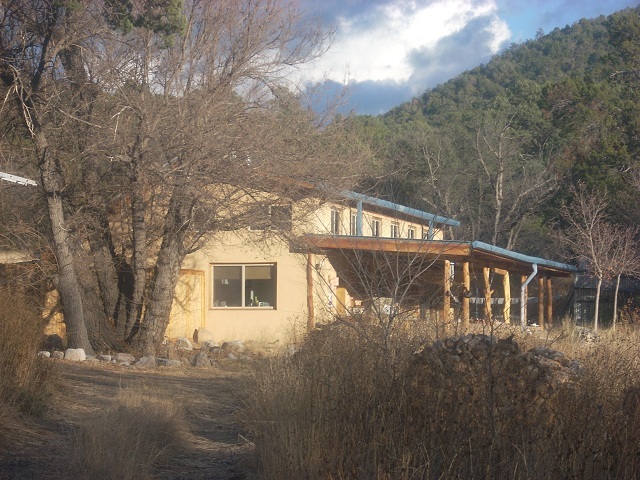 Our house is an off-the-grid 1000 sq. 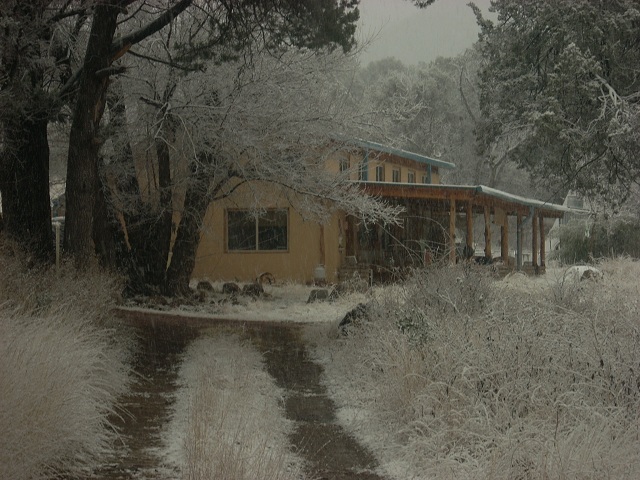 foot straw bale with interior adobe walls. The ceiling is 15 feet high allowing for southern facing clearstory windows. There are 2 porches running the 50 foot length of the building. The tiled front porch, facing the year-round stream and stream-side patio, is 500 sq. feet, with a full outdoor kitchen, double sinks, a stainless steel counter and stove. The back porch is 400 sq. feet. The shop is 30x40 on a cement slab with all the tools necessary to run the compound. There is a 9 x 15 guest room above the shop. 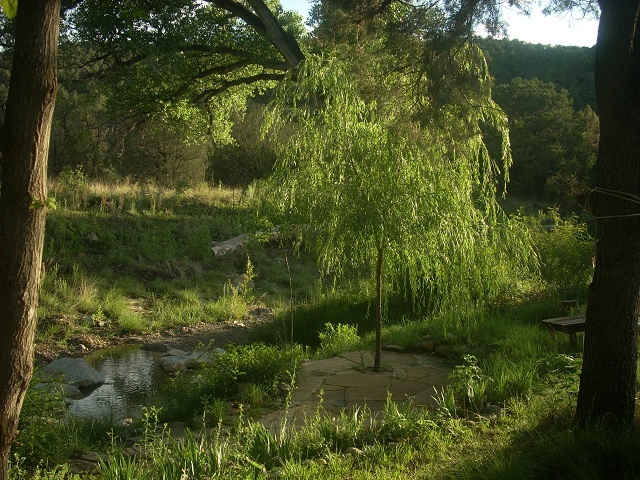 The casita is an 8 x 12 guest bedroom overlooking the stream, at the back of the garden. There are 4 other sheds of various sizes. Our electric system is solar. It services the house, including a washing machine and Sun Frost refrigerator, the shop with all its power tools, the garden shed and the casita. We are connected to the Web with a satellite dish and we have cell phone service through our roof-top antenna. 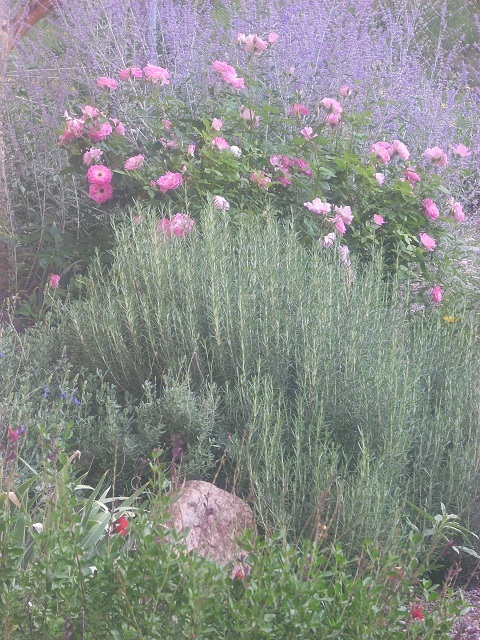 The vegetable garden is 46 x 54 (2,500 sq. feet) including a 36 x 10 hoop house for extending the growth period through the winter. There are numerous extraordinary building sites on the land, some stream-side, and some with 360 degree views of the surrounding wilderness.